Android Jelly Bean keyboard ported for Ice Cream Sandwich! 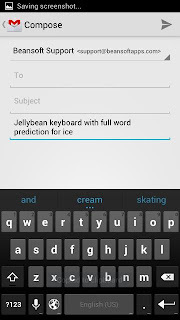 One of the more obscure features of Android 4.1 ('Jelly Bean') is a revised keyboard, said to offer better, faster text-prediction. The Day #1 Google I/O Keynote offers a very brief demo, revealing a striking similarity to the 3rd-party application called SwiftKey ...long considered by many the best Android replacement keyboard. Some users say it's better than Apple's IOS keyboard -- high praise, indeed. As usual with early versions of a ported app, there are some known issues. For now, the user dictionary hooks are switched off. Also, please note that both the 'normal' and 'bigram' prediction are currently supported for just six languages: Brazilian Portuguese, English, French, German, Russian, and Spanish. Of those, only English has full predictive function. The app's Play Store page is linked below, along with a temporary Dropbox link. Again, remember that any ported app is a work-in-progress -- expect some glitches. Also, if downloading from Dropbox, please note that with some Android phones you must rename the installation file, changing the file type from 'apk' to zip'. You might also want to try the new Jelly Bean 'Sounds Search' app. This is a music identification widget that ties into Google Music, offering handy one-click ID of the song you're playing. The widget displays artist details, (thumbnail) album art and pricing, along with a direct link to the Google Play Store, for easy ordering of any song or album.